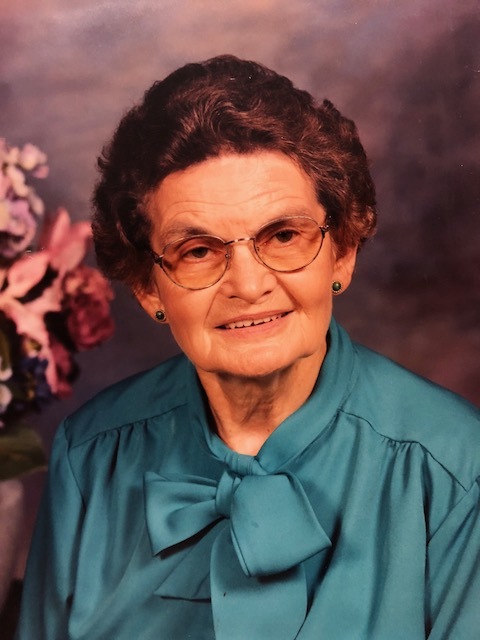 Catheryn A. Fenters, 94, of Winamac formerly of Royal Center, passed away peacefully at 6:03 a.m., Friday, July 13, 2018 at Pulaski Health Care Center. Born April 20, 1924 in Williamsport, she was the daughter of the late Carl and Cora (Livengood) Walker. On September 2, 1943, she married Oran B. Fenters. He preceded her in death in 1979. She was a 1942 Williamsport High School graduate. Catheryn was formerly a Matron and Cook at the Montgomery County Jail and also formerly served as Chaplain at the Royal Center United Methodist Church Pre-School for 7 years. She also was known for teaching piano lessons and baking her famous pies. Catheryn was also a homemaker. She was a member of the Royal Center UMC and Mary Martha Circle. Survivors include her daughter, Mary Plummer (Larry) of Kewanna, sons, Dennis J. Fenters (Rita) of Indianapolis, Michael E. Fenters (Cheryl) of Lafayette and Alan L. Fenters (Liz) of New Breman, Ohio, niece, Janet Fay (Pat) of Crawfordsville, nephew, Bruce Darling (Mary Ann) of Port Washington, New York, and grandchildren, Carl, Rachael, Carol, Stefani, Michael, Jennifer, Jeffery, Austin, Katheryn, Erika, Valerie, Andrew, Ashley, Aaron, Nathan and Jacob. She is also survived by 22 great grandchildren. She was also preceded in death by a son, Mark Fenters and sister, Hester Darling. Services will be held at 10:30 a.m., Monday, July 16, 2018 at Harrison-Metzger-Rans Funeral Home, Royal Center Chapel. Visitation will be held from 4:00 – 8:00 p.m., Sunday, July 15, 2018 at the funeral home. A Graveside Service will be at 2:30 p.m., Monday, July 16, 2018 at the Waynetown Masonic Cemetery in Waynetown, Indiana. Memorial contributions may be made to Potter’s Wheel Pre School in Royal Center. Please sign the online guest book or leave condolence for the Fenters family at www.ransfuneralhomes.com.